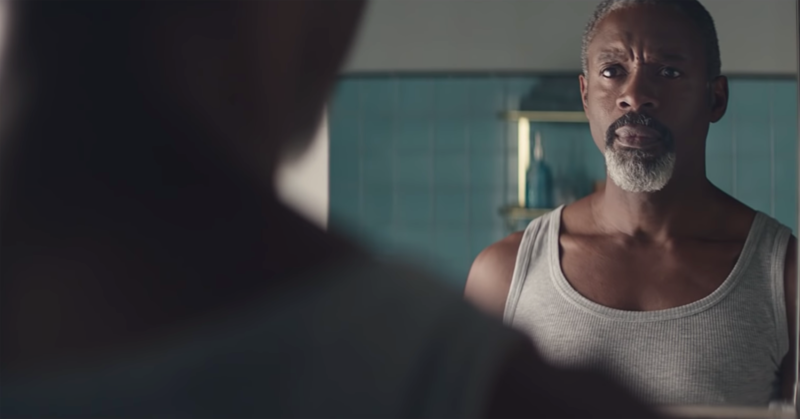 The backlash against Gillette’s new ad targeting toxic masculinity is likely overstated, according to new survey research from Morning Consult. The two-minute spot, which calls out harassment and asks men to be better, was met with a range of condemnation, praise, and snark from social media users and the commentariat. However, a new survey testing the commercial finds it resonated with most consumers in a positive manner and improved their perceptions of the razor company. Morning Consult surveyed 2,201 American adults in the days immediately following the campaign release (January 15 and 16). Additional brand-tracking data from Morning Consult’s platform, Brand Intelligence, indicates any impact on Gillette’s reputation is likely negligible. 1) The ad successfully positioned Gillette as socially responsible and in-line with consumers’ values. 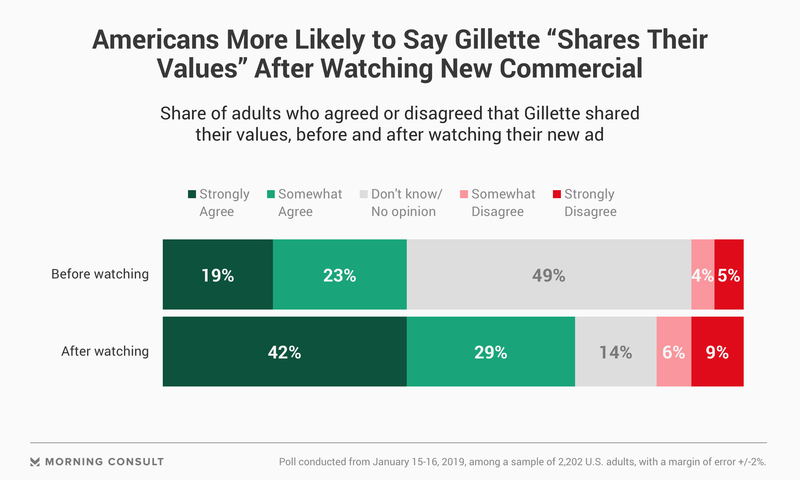 Before watching the commercial, 42 percent of consumers said they agreed Gillette “shared their values.” After watching, that figure jumped to 71 percent. Additionally, the share of consumers who said Gillette “is socially responsible” grew from 45 to 72 percent. 2) Overall, the ad was well received by those who watched it. 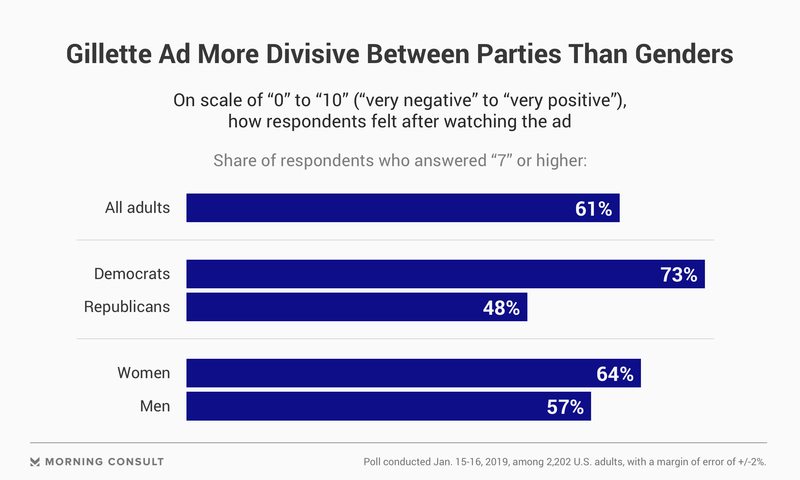 Asked to rate how positively they felt about the ad on a scale of 0-10 (10 being very positive), 61 percent gave it high marks (7-10), 23 percent were more neutral (4-6) and 17 percent gave the commercial low marks (0-3). Gillette customers were slightly more likely (64 percent) than the average consumer (61 percent) to have a positive reaction. As the graphic below illustrates, Republicans had a more negative view of the ad than Democrats. 3) Despite the internet firestorm, few consumers reported having seen negative buzz. At the height of the supposed controversy, just 8 percent of consumers said they’d seen, read, or heard something negative about Gillette over the past week. Overall, 32 percent of consumers reported seeing news about Gillette – and the majority of it was positive. 4) Harry’s and Dollar Shave Club customers are more likely to buy Gillette after watching. Among consumers who indicated they use products from either Harry’s or Dollar Shave Club, 56 percent said they would be more likely to buy from Gillette after watching the commercial. Just 18 percent say they would be less likely. 5) Brand-tracking data shows a negligible impact on purchasing consideration. In addition to surveying respondents directly about the commercial, Morning Consult also tracks consumer perceptions of over 2,000 brands through Brand Intelligence on a daily basis, including Gillette. Based on this tracking data, we are able to ascertain how sentiment shifted after the commercial’s release. The results show slight downward movement on key metrics including purchasing consideration and favorability. However, the shifts are minor, indicating most consumers are either unaware or unconcerned with the ad in either direction. Those minor shifts could possibly grow in the coming days. In the two weeks before the campaign launch, 69 percent of Americans said they would consider purchasing products from Gillette. In the two days following the ad, that moved to 65 percent. Sixty-five percent is well within the bounds of Gillette’s normal purchasing consideration range — it has been at that level or lower at multiple points over the last year. The dial-test video below shows how Democrats, Republicans, and independents reacted to the commercial. Morning Consult asked respondents to indicate in real time whether they had favorable or unfavorable views of the commercial they were watching. Trusted by over 100 leading companies, Morning Consult's brand management platform, Brand Intelligence, equips brands with survey research data at unprecedented scale, speed, and accuracy. Methodology: This poll was conducted from January 15-16, 2019, among a national sample of 2202 adults. Results from the full survey have a margin of error of plus or minus 2 percentage points.